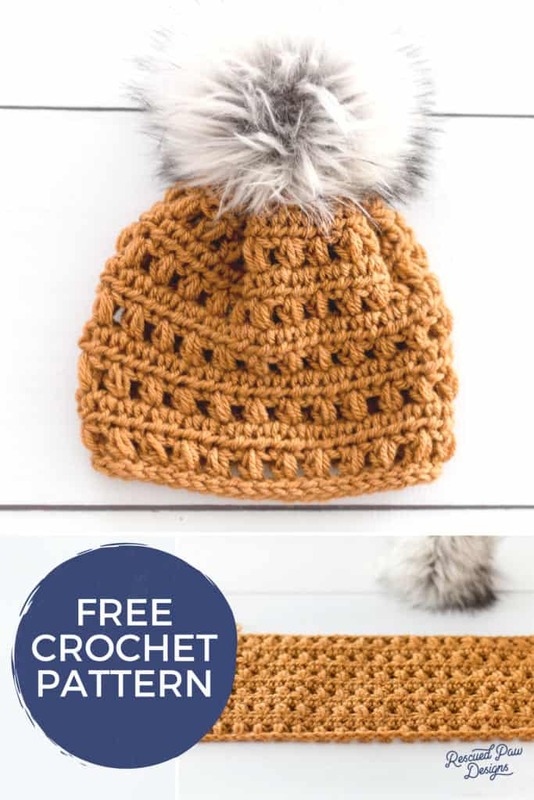 Use this free crochet pattern resource to make your very own crochet beanie hat with a faux fur pom! 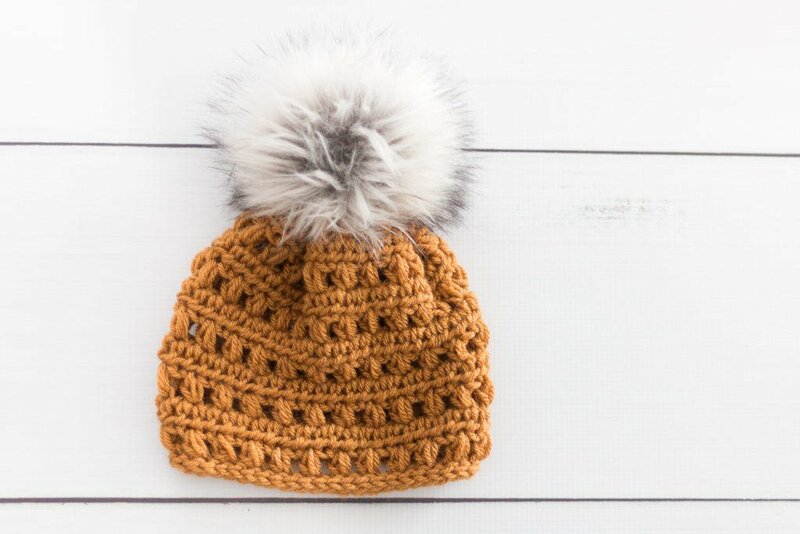 If you have noticed online lately there has been a trend of crochet hats with huge faux fur poms on them instead of the traditional yarn pom. This trend is not going away anytime soon so I decided to throw my own pattern into the mix! 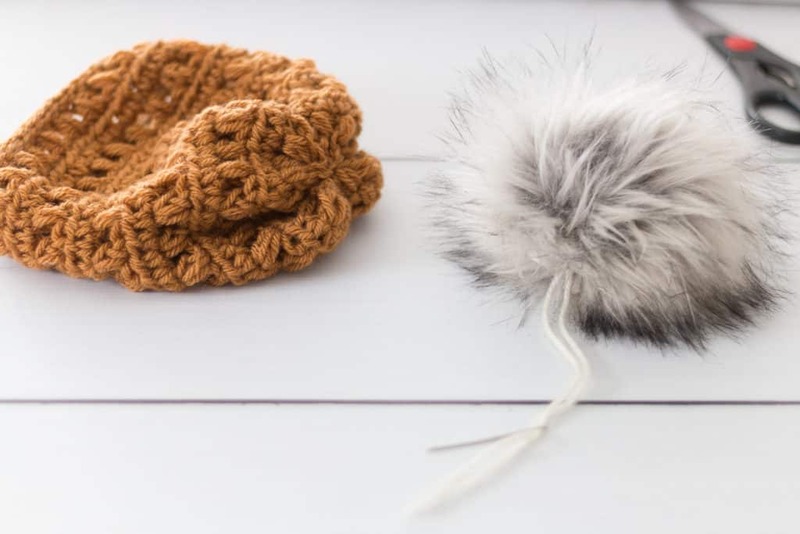 If you’d like to learn how to make a beanie with one of these pom poms and learn where to find good quality poms online then I can help! 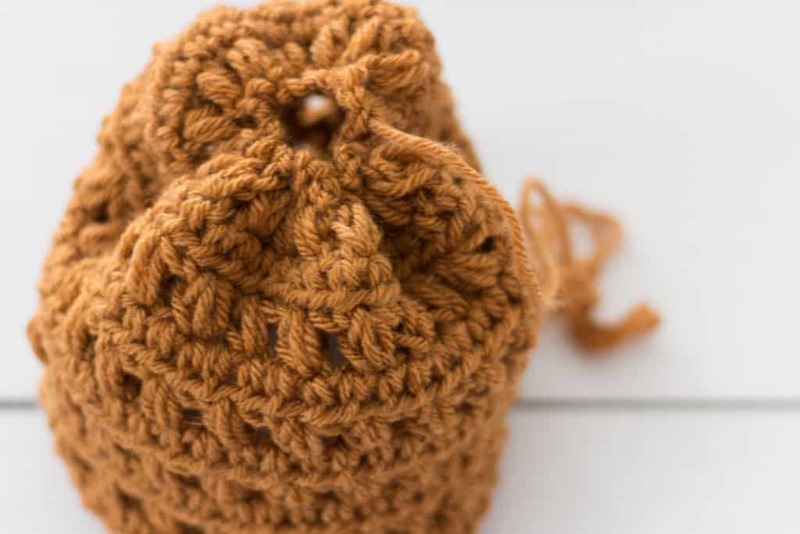 Read on down to find out how to crochet a hat with a pom pom! For my faux fur pom hat I decided to go use Lion Brand Yarns Vanna’s Choice in a pretty honey mustard color! Just like these fur poms the color mustard is very in right now so why not combine the two. 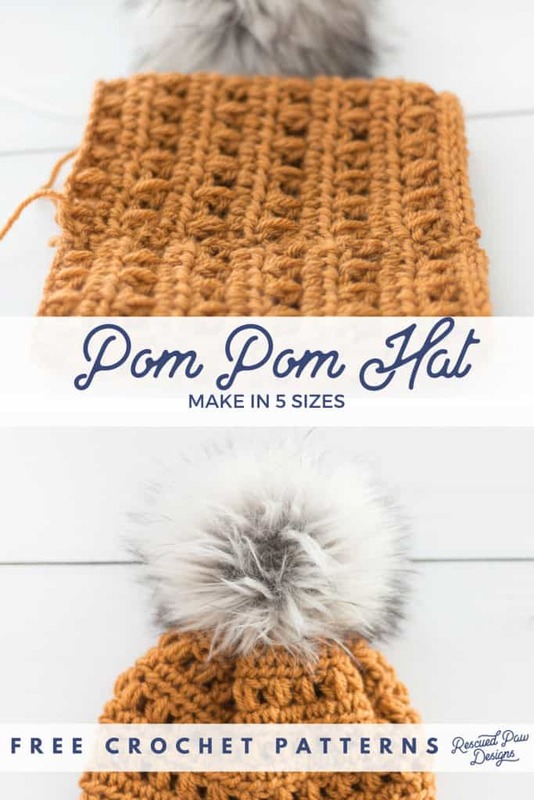 I have tried quite a bit of poms over the past year but my favorite are from a small business owner Pineapple Lane Crafts who I found on Etsy! She makes awesome quality poms at a great price! 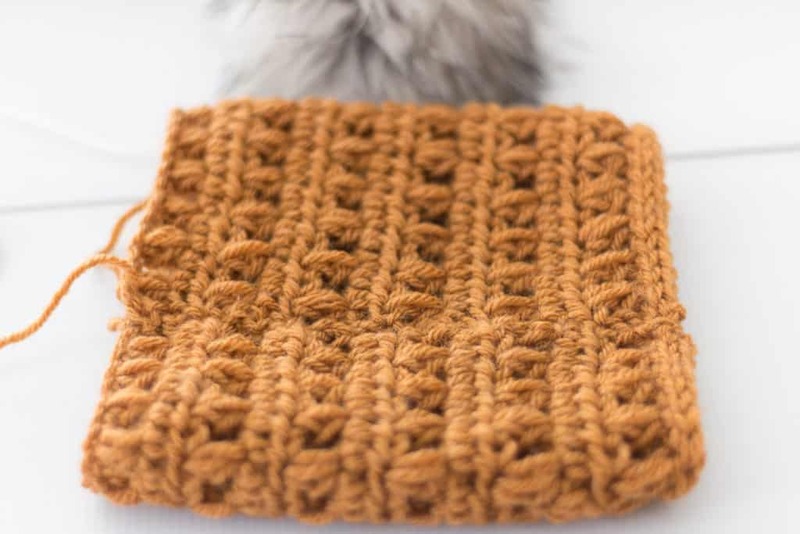 This Simple Beanie is worked in the rows instead of rounds! This crochet hat is worked a little different than some of my other designs as it is worked in rows instead of in the round! 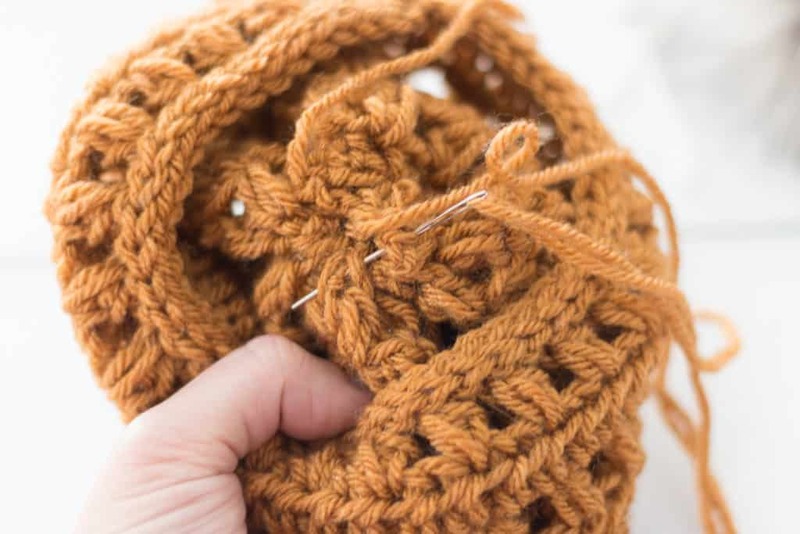 This way of crocheting up a hat is great for a beginner crochet level and it works up quickly! After you finish all the rows you will need to sew up the side and the top with a yarn needle. After everything is finished up the handmade pom I talked about earlier is the perfect topper! More Winter Hats to keep you warm! If you love crocheting hats or live in a COLD place like me… (Pennsylvania) then you will probably need more than one hat to keep you warm. 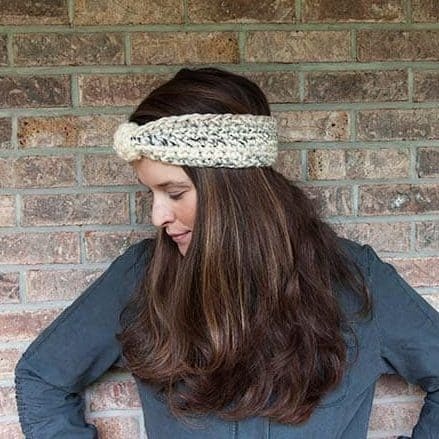 Winter hats or headbands are a must here for me like the snowy crochet ear warmer below. You could also explore the RPD free crochet hat archive if you are looking for something different too. 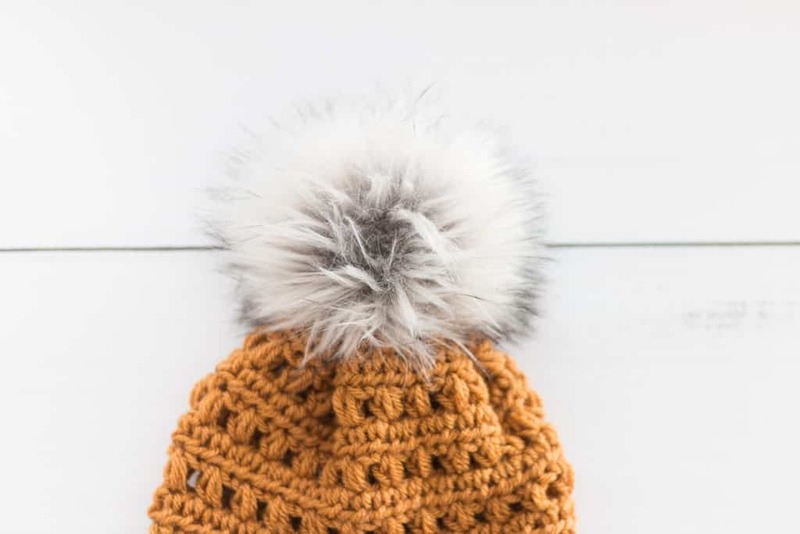 Ready to get started on your Fur Pom Pom Hat? Read on down to find the full pattern, material list and notes on how to make this fun hat. A printable PDF can be found in my shop Yarn Mamas if you would prefer an AD-free version. CLICK HERE! or add to cart below. 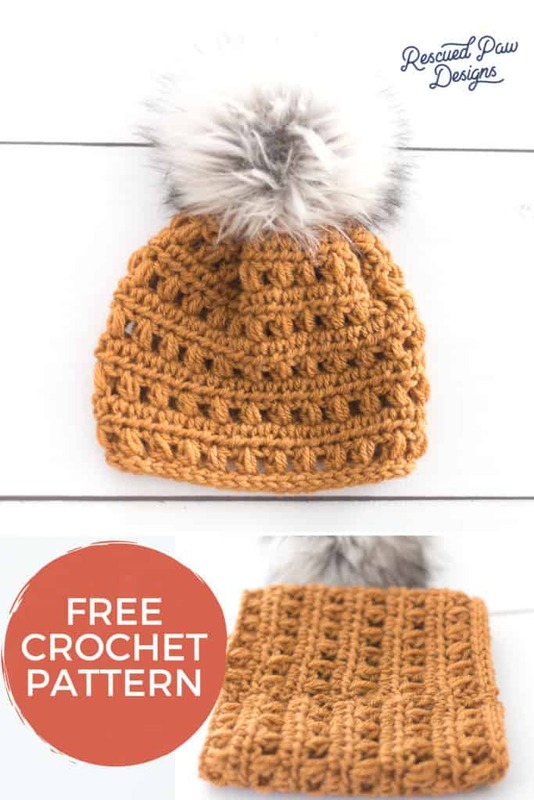 Description: This simple hat is perfect for all levels of crocheters and the added touch of the pom gives it the perfect final touch. Gauge is important proper sizing. If gauge is not followed then it will result in a hat that is too small or too big. Please take care and follow gauge. To learn why gauge is important “click here“. The finished sizes are as follows when correct gauge is followed. It’s important guys! Row 2: Ch 1, starting in the first st hdc, hdc in every st across, turn. Row 3: Ch 3, in the first st puff, *sk a st, puff, repeat from * across until you are left with 2 st’s, sk a st and make a dc in the last st, turn. Repeat row 2 + 3 until you reach row 11. Turn. Repeat row 2 + 3 until you reach row 13. Turn. Repeat row 2 + 3 until you reach row 15. Turn. Repeat row 2 + 3 until you reach row 17. Turn. Repeat row 2 + 3 until you reach row 19. Turn. 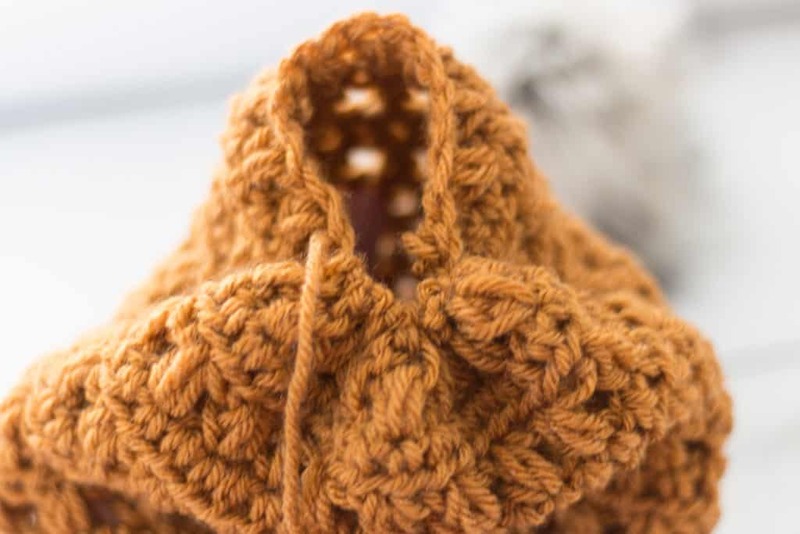 Follow the step by step instructions below to finish off your new crochet hat pattern! With a yarn needle use the mattress stitch seam the short sides of the hat together as shown below. 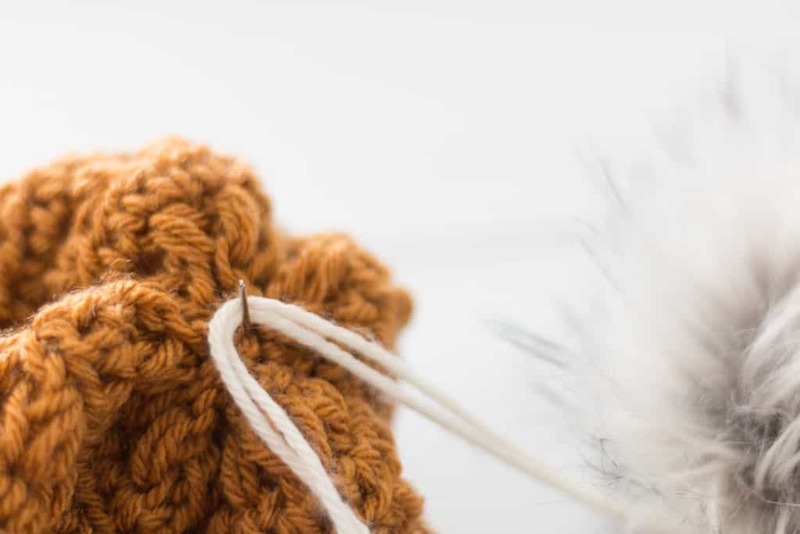 If you’d like to freshen up your mattress stitch skills then check out this post about “How to do the mattress stitch in crochet“. 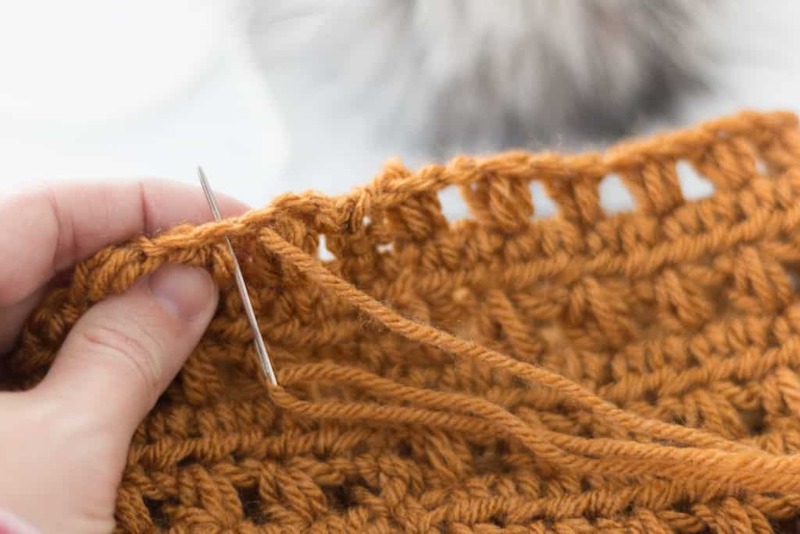 Once you have reached the top of the hat you will still be using the extra tail of yarn from before to close off the top of the hat by weaving around the edges. Once you have made one circle around you will pull the yarn tight and pull your yarn needle down the center of the hat. I then suggest weaving in the tail end once again along the inside as shown below on the inside of the hat. Leave that tail end there with a 4 inch tail. Trim if necessary. See pics below on how to close off the hat. You will attach the yarn needle to the yarn that is attached to the pom (you can find where I got mine below in the blue box!) Pull through the center of the hat. Turn the hat inside out. Pull the 4 inch yarn tail in between the two yarn ends from the pom and tie to secure. Do this as many times as you feel necessary and then if you want extra assurance that the pom will stay weave in those tail ends throughout the hat. Attach the pom pom (which is so fun to add and oh so pretty) like shown below. If you’d like to grab your own pom pom then “Click Here” to check out the shop where I found mine! PS: I love supporting small businesses like Cindy’s! Finish up by weaving in ends throughout the hat with the yarn needle. I’ve been watching your IG, waiting for you to publish this one. Think I’ll whip one today! Hi Kimberly. The puff stitch closes off with a ch 1. So even though you are skipping stitches. the ch 1 of the puff makes up for it. 🙂 Happy Crocheting! 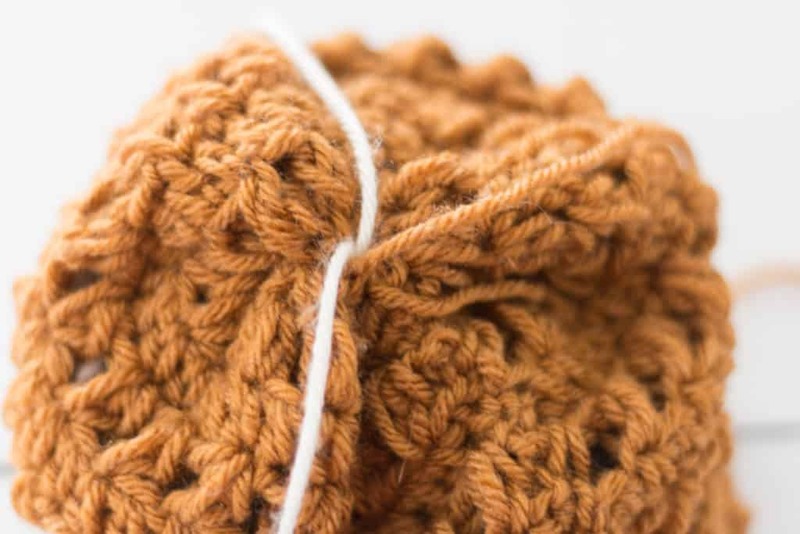 I am getting confused with the Puff Stitch – do I YO and go into the stitch 3 times? There are only 2 times in the description. 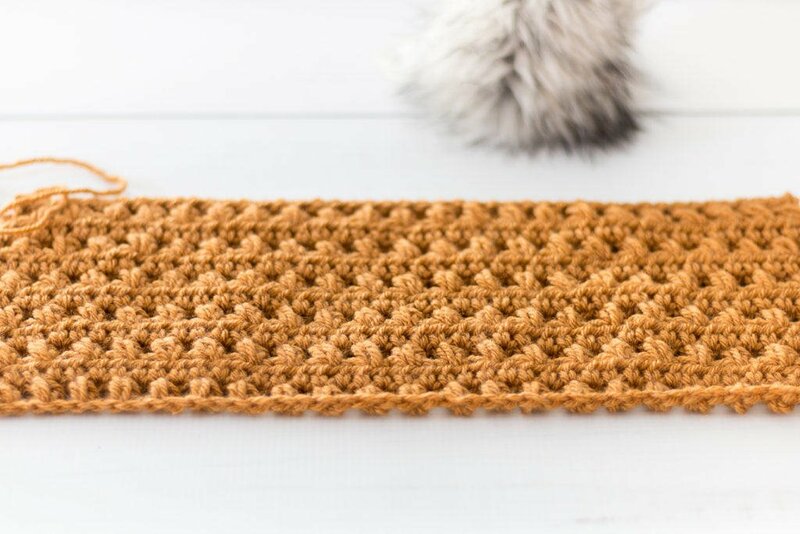 Newbie here and easily confused with stitches… 😉 Thank you! Hat is so adorable! I am not sure where it says 2 times. If it does say that anywhere I’d love to fix it!